An “elderly gentleman” carried a battered brown box littered with antiquated ammunition—including a World War II-era anti-tank round—into a police department Tuesday about 100 miles west of Chicago, giving the front desk clerk quite a scare. Reached by telephone by NBC Chicago, Dixon, IL, police Lt. Clay Whelan said the man had an affiliation with a nearby gun range and brought the old ordinance to police to dispose of. The explosives and bullets were then taken to a nearby garage and the bomb squad from Winnebago County was called in. “If you find an unexploded WWII anti-tank round in your home, PLEASE, don't drive it to the police department in a cardboard box,” a Tuesday tweet from the Dixon Police Department reads. 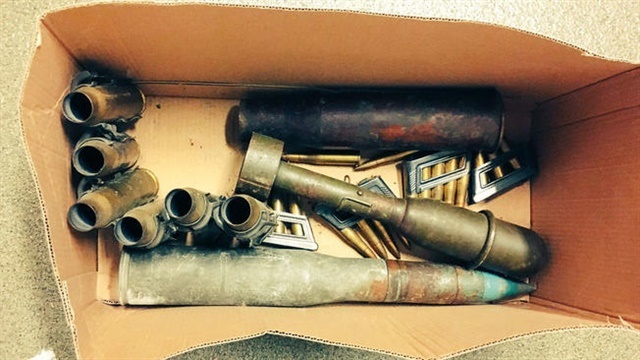 “Call us and we will come to you to help dispose of it,” the police department tweeted, referring to any cardboard boxes of anti-tank rounds one might have lying about. The department tweeted a second picture of a hazardous devices and explosives squad vehicle from the Winnebago Sheriff’s department. Whelan said the shabbily transported ammunition was not the first time explosives were brought into the department. “Please don’t bring live explosives to our department,” he said.